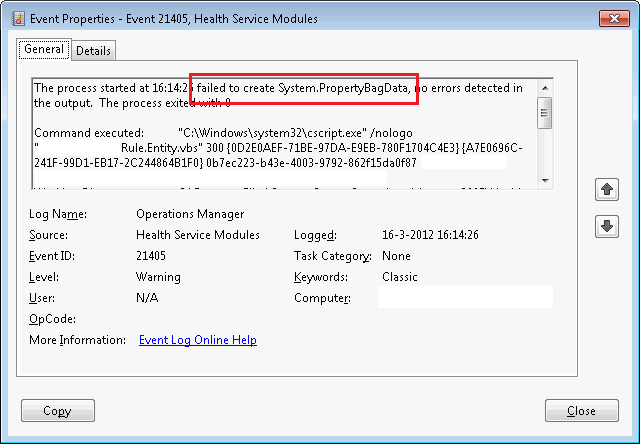 A System Center Operation Manager (SCOM or OpsMgr) management pack might cause warning event with ID 21405. This event is raised when a script is run without returning any data. A script is run to discover objects or to query data (to collect data – a rule – or to monitor and object – a monitor) and should return this data to the MOM.ScriptAPI object so it can be processed. If a script is run without returning data OpsMgr suspects an issue. A script might not return data because of antivirus, DEP or by design. If you design a management pack, continue reading. Secondly you need to add an event policy at the end of the datasource tag. If you have a script that is used to discover objects and it fails to complete successfully, there is a chance that the objects disappear from OpsMgr. To avoid this you can set the IsSnapshot property of the CreateDiscoveryData to True, as described by Boris Yanushpolsky. Date: 3/16/2012 8:20:30 PM Application: System Center Operations Manager 2007 R2 Authoring Console Application Version: 6.1.7221.49 Severity: Error Message: : XSD verification failed for management pack. [Line: 135, Position: 18] The element 'DataSourceModuleType' has invalid child element 'EventPolicy'. List of possible elements expected: 'Configuration'. System.Xml.Schema.XmlSchemaValidationException: The element 'DataSourceModuleType' has invalid child element 'EventPolicy'. List of possible elements expected: 'Configuration'. 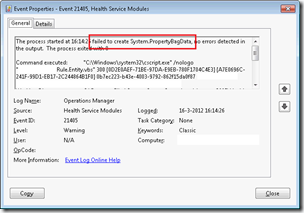 The element 'DataSourceModuleType' has invalid child element 'EventPolicy'. List of possible elements expected: 'Configuration'. System.Xml.Schema.XmlSchemaValidationException: The element 'DataSourceModuleType' has invalid child element 'EventPolicy'. List of possible elements expected: 'Configuration'. This is because the EventPolicy element isn’t defined properly. I’ve got a rule that collect performance data using the Microsoft.Windows.TimedScript.PerformanceProvider data source module. I know that the object I’m querying not always return data because it only generates data at certain moment, so I don’t want to return a PropertyBag. Before you can add the event policy to a datasource you need to include the CommandExecuterSchema schema and add a EventPolicy element to the DataSourceModule.